Oh look, it's another bed I wouldn't mind staying in on Christmas morning. 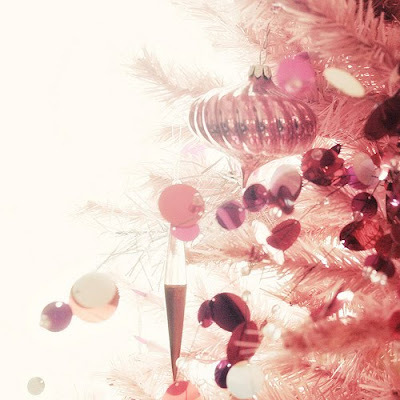 The prettiest pink Christmas tree I've ever seen by Making it Lovely. Simple decoration mean easy clean up, and I am all about some easy clean up. If I thought I could find enough pine cones, I'd definitely try to replicate this lovely wreath. This is sweet alternative to a small table tree and the red and white palette is simply classic. 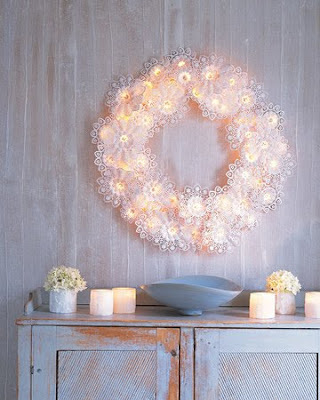 Yup, this is a doily wreath and I'm in love. 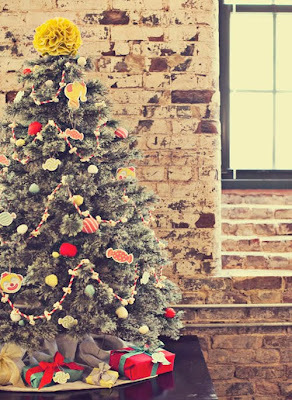 One of my absolute favorites images from this season...the circus themed Christmas tree. Previous holiday inspiration images can be found here. ...#93, Ashley! Congrats, I'll be in touch soon! 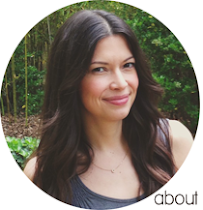 If you somehow missed it, make sure to check out Enchanted Leaves. Thank you Nedda for the awesome giveaway and for being a great sponsor! Love that doily wreath! Did you see my tree? AAAH! That pine cone wreath is gorgeous! I abhor the pine tree in my front yard because it drops pinecones and pine needles ALL YEAR LONG. But now I can make something lovely out of all that mess! Thank you! Oh, I absolutely love the third picture. Simple, clean lines. I have issues each year decorating for Christmas, b/c everything can start to look "fussy" if not done right. Ahh, I love Christmas! LOVE that Twig & Thistle image! So vintage! How festive... this time of year is so beautiful, I just love it! I just love that first image of the bed and the stockings on the foot board. I could definitely see myself staying in that bed on Christmas morning too! These are lovely finds. I, too, love the stockings at the end of the bed, the doily wreath and the table tree. Such sweet details. (I'm flagging them for next year)! 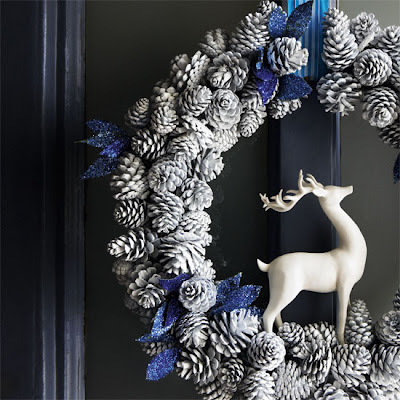 I love every one of these, but the pinecone/deer and doily wreaths are my favorite! I'm with you on the "easy cleanup". Because we move so frequently, I've actually pared my decorations down to one giant box, plus one little box of lights, and one as-of-yet-decorated white wreath (a project that may have to wait until next year, I'm afraid because I can't find my glue gun). and now i have bed and decoration envy! love #1! i can think of no place i'd rather be than that rad bed! The pine cone wreath is lovely. I wouldn't mind hanging it on my door. Of course! I never thought of stockings on the end of the bed!